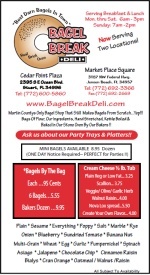 Martin County’s Only Bagel Shop That Still Makes Bagels From Scratch…Yep!! Kettle Boiled & Baked In Our Stone Oven By Our Bakers !! Ask us about our Party Trays & Platters! !